I recently read an article online that points to who the church can be. The picture on the left was what greeted the Rev. Thomas Broad and the members of Grace Episcopal Church in rural New York one morning. 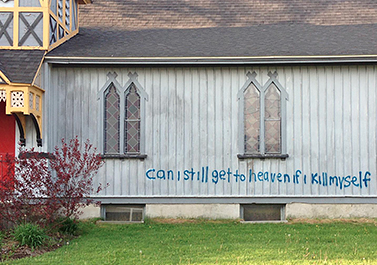 Someone had vandalized their beloved church building. How would you and your church have responded and reacted to this act of violation and vandalism? I love the way Grace Episcopal Church responded. They took the question, and more importantly the person who might be hurting, seriously that they looked beyond the vandalism. Sure it could have been someone who just wanted to be snarky. Sure it could have been someone who was playing a cruel joke. But what if someone was really hurting? How should the church of Jesus Christ respond? I love what Grace Episcopal Church did. They used their own church building to proclaim a word of truth and grace.